Demure Victorian Ladies? Not! | STEAMED! « Happy New Year, from Everyone at Steamed! One of the things I love best about writing steampunk are the opportunities for research. Take this, for example: did you know that during the 1870s and well into the 1900s there was a all-female crime syndicate in opperation in London? Oh, yes, dear reader. It’s true! And it’s the fodder for a steampunk imagination like mine run rampant. 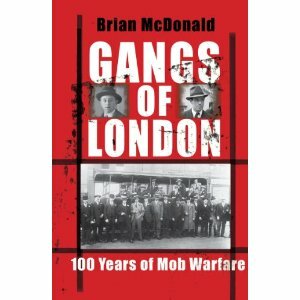 In his new book, Gangs of London, author Brian McDonald reveals details of one all-female gang, who rule the underworld of London for nearly two centuries. The Forty Elephants–or Forty Theives–was a well-run collective of cells who opperated across London and in other cities as well, headed by a formidable “queen”, which was responsible for most of the largest shoplifiting syndicate ever seen in London between the years of 1870 to 1950. Police records indicate that the gang, which was first mentioned in newspapers in 1873, had in fact been in operation even longer, since the late 1700s. The ladies of the syndicate dressed in specially tailored clothing, coats, cummerbunds, muffs, skirts, bloomers and hats, sewn with hidden pockets. They raided the West End shops of London, pocketing, literally, goods worth thousands of pounds from diamond rings, to ranksacking employer’s homes after providing false references, to blackmailing the men they seduced. The gang guarded their territory fiercely, demanding percentages from others caught stealing from the stores in their turf. If the money wasn’t paid, they showed no mercy, arranging beatings and even kidnappings until it was paid up. If caught, they knew they could be sentenced to between three to 12 months’ hard labor, or three years in prison. “Many a husband lounged at home while his missus was out at work, and many an old lag was propped by by his tireless shoplifting spouse. Some of these terrors were as tough as the men they worked for and protected,” McDonald added. How could you not be intrigued by ladies who buck the system with such panache?